Amanda Kessel, 21, currently the Patty Kazmaier Award winner as best women’s college hockey player in the U.S., has a strict pre-game routine. For the last couple of years it includes having an arrow drawn on her left hand before a game as a reminder to stay positive. Most importantly, Kessel can’t do it herself. Someone else has to draw the arrow on her hand. Having played organized hockey since she was five, she is the ultimate team player. Kessel drove an arrow through the immense heart of the Canadian women’s hockey team Tuesday night before 13,776 spectators at Scotiabank Place in Ottawa, Canada. Her game-winning goal in the third period completed a Team USA comeback from a 1-0 deficit and lifted the Americans to a 3-2 triumph in the gold medal game of the 2013 International Ice Hockey Federation Women's World Championship. Winning their fourth gold medal in the last five world championships—and fifth gold overall—was sweet revenge for the Americans coached by Harvard University head women’s hockey coach Katey Stone. Last April, Team Canada beat the Americans 5-4 in overtime in the IIHF World Championship world gold medal game at Burlington, Vt. Team USA out-shot Canada 30-16, similar to the American 43-11 shooting dominance in Monday’s 3-0 semi-final victory over Finland. 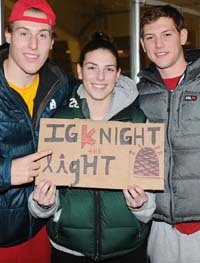 Sun Valley’s 23-year-old Hilary Knight scored the first goal and eventual game winner in that semi-final game. Kessel, named U.S. Player of the Game Tuesday, skated down the right side and fired a wrist shot from the faceoff circle over the glove of Team Canada goalie Shannon Szabados, 26, three minutes into the third period. Szabados, who beat the Americans in an overtime shootout 3-2 April 2 in the first game of worlds, was also in the goal for Canada’s gold medal victory over the Americans in the 2010 Winter Olympics at Vancouver. Back in 2010 Kessel was just graduating from Shattuck St. Mary’s High School in her native Madison, Wisconsin. She had played Bantam hockey with a state and regional tournament winning boys’ team. She had led Shattuck to two straight U-19 women’s national hockey championships, in her final season scoring 67 goals and 55 assists in just 46 games. Since, Kessel has been the scoring star for the University of Minnesota Golden Gophers, leading Minnesota to two straight NCAA Division 1 tournament championships. The most recent title, achieved with a 6-3 victory over Boston University March 24 in Minneapolis, capped an unprecedented 41-0-0 unbeaten season for Minnesota. Kessel scored 46 goals with 55 assists for 101 points and eight game winners for the Golden Gophers this past season and won college’s hockey’s Patty Kazmaier award. In 114 college games, she has scored 97 goals with 134 assists for 231 points. She had two goals and two assists in the title game victory over Boston University, identical to the two goals and two assists she had in her first college game as a freshman back on Oct. 1, 2010. But Kessel comes with quite a pedigree. Her brother, Phil Kessel, played for the University of Minnesota in 2005-06 and was drafted fifth overall in the 2006 National Hockey League Entry Draft by the Boston Bruins. He now plays for the Toronto Maple Leafs. Like his sister, competes internationally for Team USA, the 2010 Olympic silver medalist. Amanda’s younger brother, Blake Kessel, plays in the American Hockey League. Amanda Kessel’s game winner Tuesday gave Team USA four wins (4-2 over Finland, 5-0 over Switzerland, 3-0 over Finland, 3-2 over Canada) to go with its 3-2 shootout loss to Canada in this year’s world championships. Playing at home as defending champion, Team Canada was a slight favorite. Canada (32-3 goals against entering the gold medal game) had walloped Switzerland 13-0, Finland 8-0 and Russia 8-1. With its 32 goals in four games on its home ice, Team Canada boasted eight of the tournament’s top 10 scorers including tournament MVP Marie-Philip Poulin, who led all players with 12 points. Poulink assisted on both of Canada’s goals Tuesday. But the Americans were hot to trot and Kessel had the arrow on her hand. The U.S. battled hard in the first period, putting up 12 shots to Canada's eight, but the Canadians scored the lone tally of the frame. Courtney Birchard skated the puck into the U.S. zone, wound up and took a slap shot from the top of the right faceoff circle that beat a screened American goalie Jessie Vetter of Cottage Grove, Wisc. high to the near side at 9:50. Brianna Decker (Dousman, Wis.) tied the game at 1-1 midway through the second frame on a partial breakaway in which she drove to the net, cut across the crease and tucked it under Canadian netminder Szabados’ outstretched arm. Team USA continued to outwork Canada in the period and drew four consecutive penalties, including a two-man advantage that lasted only 30 seconds before Megan Bozek (Buffalo Grove, Ill.) took a feed from Anne Schleper (St. Cloud, Minn.) at the left point and powered a slap shot past the Canadian goaltender to take a 2-1 lead. Canada evened the score on a power-play tally by Caroline Ouellette, who wired a shot through traffic past a screened Vetter at 18:50. But Kessel had the final say in the third period as Team USA remembered the unfavorable outcome a week earlier—when Canada out-shot the U.S. 15-5 in the third period and rallied from a 2-0 deficit for the tie after regulation play. The Canadians ended up taking too many penalties, eight of the 12 minutes in penalties coming in the second period when the Americans outshot Team Canada 12-2 and scored two goals. NOTES: Brianna Decker, 21, was named to the media all-star team. The 2012 Patty Kazmeier Award winner for the University of Wisconsin women tied for the tournament lead with six goals, while totaling eight points to tie for second along with Kessel ...The U.S. was 1-for-6 on the power play, while Canada was 1-for-3 ...Average age of the American player this year was 22 years and 9 months. Average height was 5-6, Kessel’s height. Russia won the world bronze medal 2-0 over Finland….In her breakout junior season for Minnesota, Kessel became only the fourth player in NCAA history to reach 100 points in a single seasoln, and she is only the ninth player to reach 200 career points in just three seasons. Team USA and Canada have now played 21 times in world competition, the Americans (outscored 65-56) trailing with 6 wins, 8 losses, 5 overtime losses and 2 overtime wins……Last year at worlds, Team USA trounced Canada 9-2 in the opening game, but Canada won on American soil in the final…There was an average of 4,626 spectators a game over the course of the 21 games played at this year’s world championships…..